The Ka'baa... (HDRi), uploaded into Flickr by _Nomad_. Click on pic to see it in Flickr. Astounding, this one is. I know very little about Islam, but I am aware of the Hajj to Mecca that moslems are required to partake in some time in their lives, if they have the means. Thought this was a terrific shot of the Hajj's centerpiece that gives a dizzying perspective of the faithful whirling around the Ka'baa shrine in the middle of the Grand Mosque. GOTTA SEE IT IN LARGE ON BLACK. And what you see here is just a very small part of the mosque. 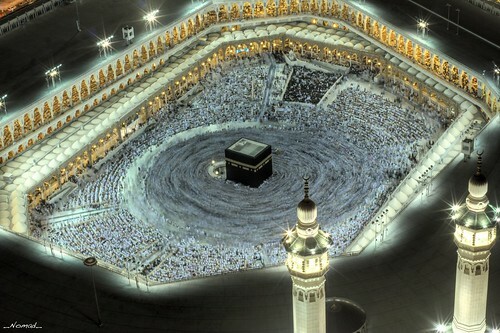 To see it in relation to Mecca itself, DEFINITELY HAVE A LOOK AT THIS (another HDR shot by the same photographer). Now that's a mosque! While there is something very intriguing about a religion where all the followers at some point journey to one place on earth, you might think by looking at the photo it could get a bit dangerous, and you'd be right.